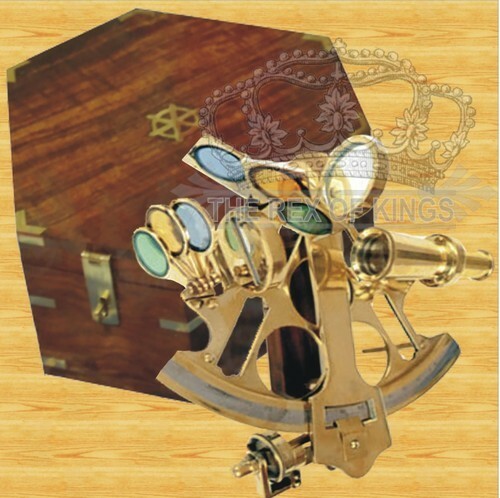 We provide a wide range of 10 inch brass sextant to our clients that has 6 different colored glass filters, which are used to reduce the intensity of the light from the sun. It also has micrometer drum, which is used for fine adjustments or second readings. It comes with a wooden box and also has an error adjustment screw behind the mirror. The arch of the scale measures 27cm (10 1/2) inches). Available in brass finish, black antique finish, nickel plated finish with sheesham wooden box or leather case. Packaging Details Wooden Box & Cartons Demands on Client. The rich manufacturing experiences, high standards of working, strict quality control and favorable team atmosphere enable the company to be able to offer high quality products and reliable services to customers. we manufacture, supply and export an exclusive range of Nautical Instruments and Nautical Gifts such as Brass Binoculars, Brass Globe, Brass Key Chain, Brass Sextant, Brass Sundial Compass and Diving Helmet. We also provide Gimbaled Compass, Nautical Sand Timer, Nautical Telescope and Searchlight & Spotlight with Tripod to our clients. Our range is manufactured using premium quality raw materials and in accordance with latest fashion trends. We are backed by a team of highly experienced professionals who help us to offer superior range of products to our clients at competitive prices. With their support, we also provide customized solution to our clients as per their requirement. Our experts also ensure that our range is free from any defects and ideal for uses. We have also developed a wide supply chain network to meet the bulk orders of our buyers within the committed time frame across the globe.